Just as butterflies fan their wings to collect the sun's energy to raise their body temperature, this absolutely gorgeous solar chandelier is also energized by the sun's rays. 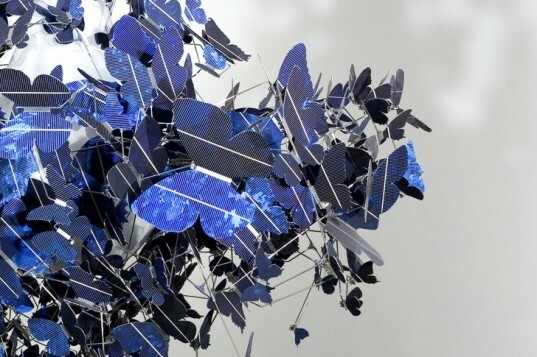 Virtue of Blue is a new work by Dutch artist and designer Jeroen Verhoeven that features of 500 butterflies cut from sapphire blue photovoltaic cells. Four different breeds of butterflies flutter around a hand-blown glass bulb, collecting the sun' energy by day to power the lamp at night. It's a stunning combination of art and renewable energy all in one amazing chandelier. On display now at London Gallery, Blain|Southern‘s Virtue of Blue chandelier measures 144 x 144 x 162 mm in size and is composed of cesium solar cells, a hand-blown glass bulb, and steel and aluminum structural elements. The butterfly solar cells are self-sustaining as they absorb daylight to power their own illumination. Four different breeds of butterflies flutter around the flame-like glass bulb in the center of the chandelier. Virtue of Blue is part of a solo exhibit called The Curious Image along with Verhoeven’s highly polished steel Lectori Salutem desk. A wonder of electrical engineering, art and fabrication, Virtue of Blue is more than a piece of eco art or even a practical light fixture – it is a stunning work that gives testament to the power of nature and sustainability. Awesome idea! And beautiful as well! Gives me lots of inspiration!!! It is a stunning work that gives testament to the power of money. It retails at a stunning £75,000! FYI, although the Demakersvan website says these solar cells are made from "celisium," which isn't even a word, and Inhabitat translated this to "cesium," these solar cells are, without a doubt, made from silicon. Since the close-up reveals a mottled appearance to the cells--as if blooms of frost were starting to form on them--we can say specifically that these are made from multicrystalline silicon, which is essentially an aggregate of smaller silicon crystals. This is a beautiful chandelier and I love the concept behind it, very clever and a nice artist approach to green design. Well done! 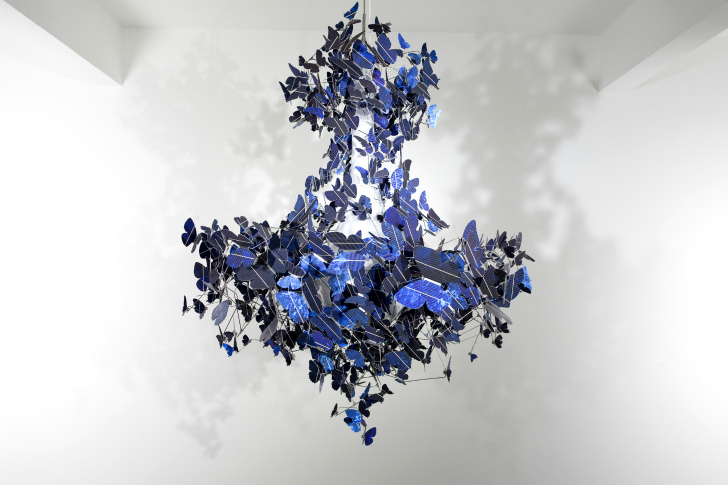 On display now at London Gallery, Blain|Southern's Virtue of Blue chandelier measures 144 x 144 x 162 mm in size. The chandelier is made from of celsium solar cells, a hand-blown glass bulb, and steel and aluminum structural elements. Four different breeds of butterflies flutter around the flame-like glass bulb in the center of the chandelier. Virtue of Blue is part of a solo exhibit called The Curious Image, which also features Verhoeven's highly polished steel Lectori Salutem desk. The solar butterflies don't actually move, but they do appear to be fluttering as the sunlight reflects off their shiny wings. A visitor to the gallery admires the chandelier. A wonder of electrical engineering, art and fabrication, Virtue of Blue is more than a piece of eco art or even a practical light fixture - it is a stunning work that gives testament to the power of nature and sustainability.